We are writing this blog post to share an exciting donation to the Americana Collection received from New Mexico DAR member Beatrice (Betty) Byrd. Ms. Byrd reached out to President General Lynn Young about donating manuscripts that have been in her family for many years and they are a welcome addition to the Americana Collection! The Americana Collection mainly consists of early American manuscripts and imprints created prior to 1830 and is home to colonial-era diaries, household inventories, samples of colonial-era currency, court records, birth and marriage records, land deeds and grants, and military papers; however, the complete collection spans five centuries. The oldest item is an English bible dating to the reign of Queen Elizabeth I and the most recent material is from the late twentieth century. Among the wide variety of documents are collections of all of the signatures of the signers of the Declaration of Independence and the United States Constitution. Today the Americana Collection contains more than 4,100 accessions. The new accession donated by Betty Byrd consisted of correspondence and manuscripts from the Olney/Gilbert/James families, as well as a deed from Henry Knox. The Byrd family has taken excellent care of them throughout the years and we were very happy to accept these documents in such good condition. When we receive a donation, the document is rehoused in acid free archival storage and stored in a controlled environment, which meets the document’s long term preservation needs. The story linking all these letters and documents together has gotten lost overtime, so we also did some research in order to reconnect the narrative that this small collection of items tells. Ezekiel and Angelica had a daughter, also named Angelica. 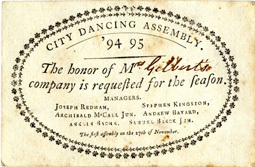 The younger Angelica Gilbert is referred to in a letter from Josiah Bacon dated October 9, 1828. Bacon begins this letter, “I have cultivated an acquaintance with your adopted daughter Angelica Macbeth and have had a conversation with her in relation to a matrimonial connection.” Bacon is seeking young Angelica’s hand in marriage, however, the Gilberts do not approve of this union. At this time this letter brings us more questions than answers. What does he mean by adopted daughter? Did this union ever take place? Angelica seems to have lived a long and productive life. In 1845 Angelica James received a letter from Beatrice Overlock; the name Overlock appears later on Angelica James’ last Will and Testament. 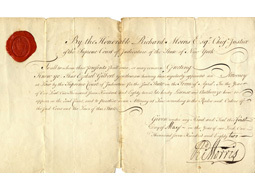 An Anna Overlock is named as the executor of her will probated in 1880. Angelica G. James also appears in city directories for Utica, New York in the later 1860s and early 1870s. She is listed as living on Sanger Road and for her occupation, Boarding and Day School Principal. The outlier of this donation seemed to be a Deed from Henry and Lucy Knox selling land to Isaac Fuller in Thomaston, Maine on June 19, 1800. However if we go back to the handwritten note from 1838 that seems to describe Angelica Gilbert’s tombstone inscription we learn that her sister Rebecca married Henry Malcolm. The Knox deed is witnessed by James Malcom and John Glerrson, which leaves us to wonder if there is a connection here as well. We have only begun to iron out all the details of the Olney/Gilbert/James narrative that plays out in this donation. Like all of the rest of the Americana Collection, this small collection of manuscripts is open to researchers. If you are interested in conducting research in the Americana Collection or your chapter or other group is interested in a tour of the Americana Room, please contact us to make arrangements: call: (202) 879-3256 or email: historian@dar.org. We welcome all visitors to DAR headquarters to view the exhibits in the Americana Room from 8:30 to 4:00 Monday through Friday. We want to extend our gratitude to Betty Byrd for donating the manuscripts that helped us tell this story. If manuscripts or a story like this are hiding your attic, please keep in mind we are always looking for ways to expand our collection and preserve our history for the future. If you have any documents that you think might fit our collection, please consider donating them. However, before sending these items to National, please contact the Office of Development or the Office of the Historian General so that we can be certain that the donation is appropriate for our collection. Any available information concerning the provenance of donated items should accompany donations to the Americana Collection. We request that donors do not attempt to repair documents before offering them to the National Society as this can cause irreparable damage to historical materials. Our ability to maintain our cataloguing software, purchase archival-quality supplies, appraise the Americana Collection, acquire new items for the collections, and also to provide them with adequate care—for storage, conservation, research use, and exhibits—is due to the generosity our members have shown us through financial contributions to the Americana Room Fund, Friends of the Americana Collection, the NSDAR Archives Fund and the General Fund. We are very grateful for your support.